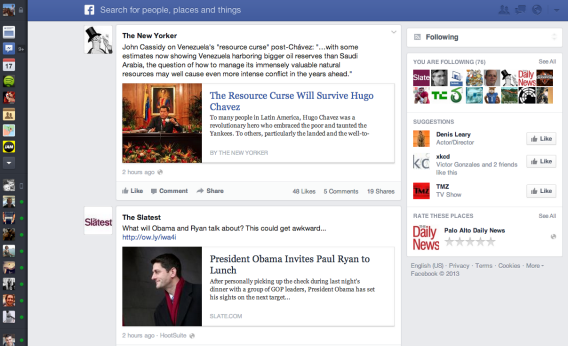 Facebook redesign: New newsfeed is morning newspaper to Twitter's CNN. A new version of the Facebook newsfeed that shows you updates only from the pages you’ve “liked” and the public figures you’re following is akin to a personalized newspaper. Other new versions of the feed, announced Wednesday, allow you to see updates only from your friends, or to see only pictures. According to sources on my Twitter feed, Facebook announced Thursday that it is redesigning its news feed for the first time since 2006. The changes will go live on the website beginning today and show up on the site’s mobile apps in the coming weeks. Based on a video of the announcement that I watched live on Twitter, I can tell you that the new look is cleaner, with much larger photos and less clutter on either side of the main feed. There will also be more visual emphasis on the content people are sharing, as opposed to who’s sharing it. The changes aren’t just cosmetic. Users will now have the option to toggle between multiple versions of their news feed, including one that shows you updates only from your friends, one that’s all photos, one that’s nothing but music, and one devoted to the pages you “like” and the public figures you follow. (It’s this last option that will most resemble a traditional newspaper, while the main news feed might be more like, in the words of one Twitter wag, “a newspaper about your friends’ babies.”) And while I didn’t catch this detail during the announcement itself, I now see on Twitter that the “all friends” feed apparently dispenses with the fancy algorithms and simply shows you all of your friends’ updates in chronological order. Those tweaks might be just what’s needed to mollify critics who found the latest iteration of Facebook’s news feed to be too repetitive or too aggressive in its filtering. But as the Huffington Post’s Craig Kannalley pointed out, we’ll have to monitor @nickbilton’s timeline to find out for sure. Of course, keeping up with the news in real time on Twitter is hard to do if you’re busy working on other things. It’s great for me, since I’m a tech blogger, but a lot of people would probably prefer to just catch up on the gist of these changes later on, when they’re sitting on the couch with their iPad—browsing Facebook.